Project number 40 in “Little Ways to Learn Acrylics: 50 small painting projects...” by Mark Daniel Nelson is ‘Reflections on metal: Tin cup and cherry’. This was not as enjoyable as painting the boat even though it was a similar exercise. Creating form using multiple shades of grey from black and white was very challenging. Not mixing enough paint to finish a painting continues to be one of my greatest weaknesses. In the end I just tried to paint and not stress about perfection. It could have been worse. 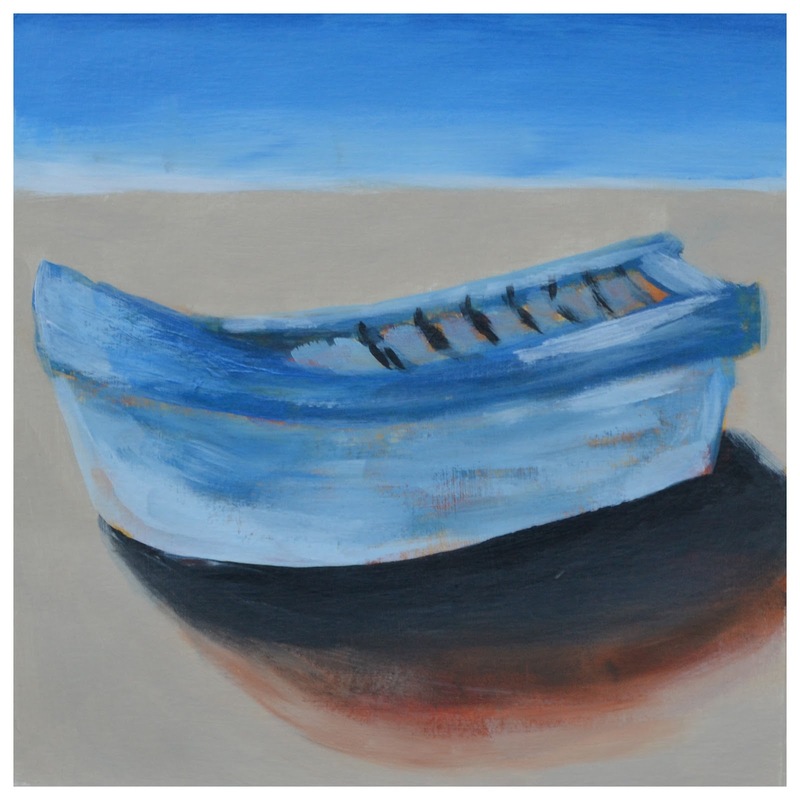 ‘Creating texture with layering: Old boat’ is project 39 in “Little Ways to Learn Acrylics: 50 small painting projects...” by Mark Daniel Nelson. Painting boats are really fun to do so this exercise was easy to complete. It was especially relaxing to create different layers and not worry too much about detail. 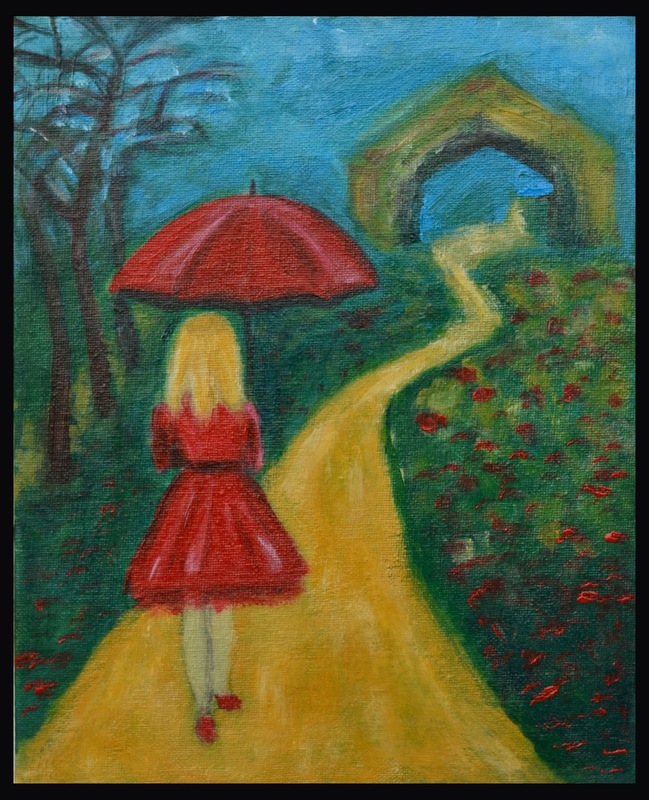 This is a fantastic exercise to do more than once and try using different colours and backgrounds. 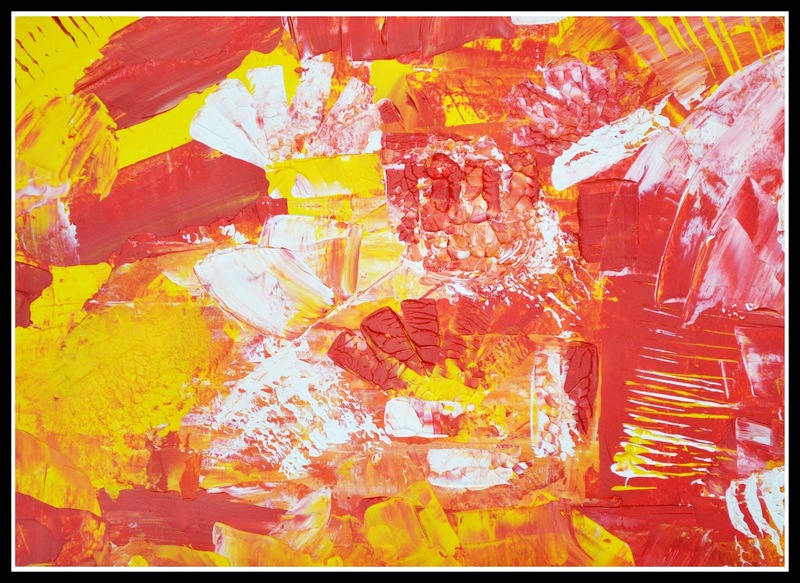 In my Monday Seasons Art Class we learned to use a pallet knife with acrylic paint. In the first assignment we were instructed to use any colours to explore different pallet knives and what marks you can make. It was only an exercise but it yielded pretty nice results. 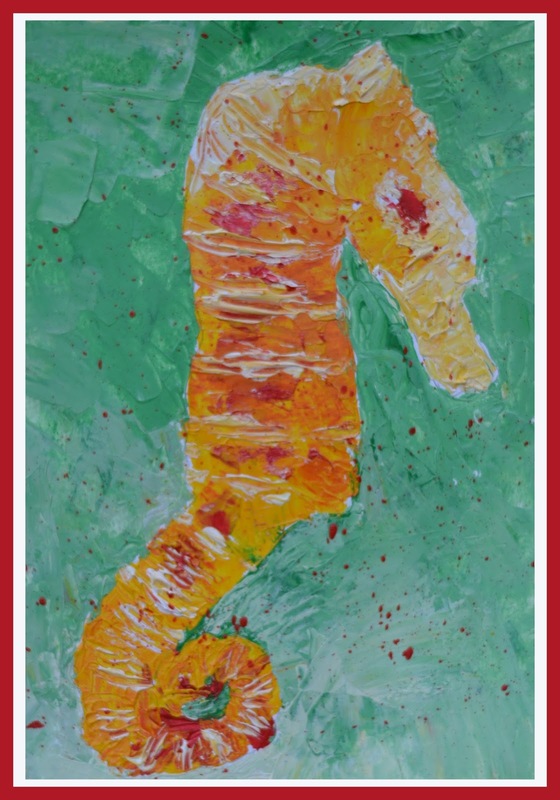 For the second assignment we were to use only a pallet knife to paint a shell or sea creature, thinking the sea horse would be easy, that’s what I did. It was difficult to draw something specific with the knife so really not a fan. 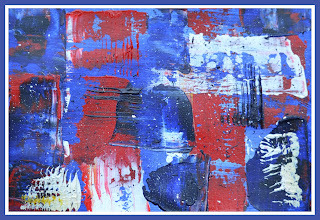 For the final assignment we were to create any abstract we wanted, so similar to the first assignment this red, white and blue abstract was born. 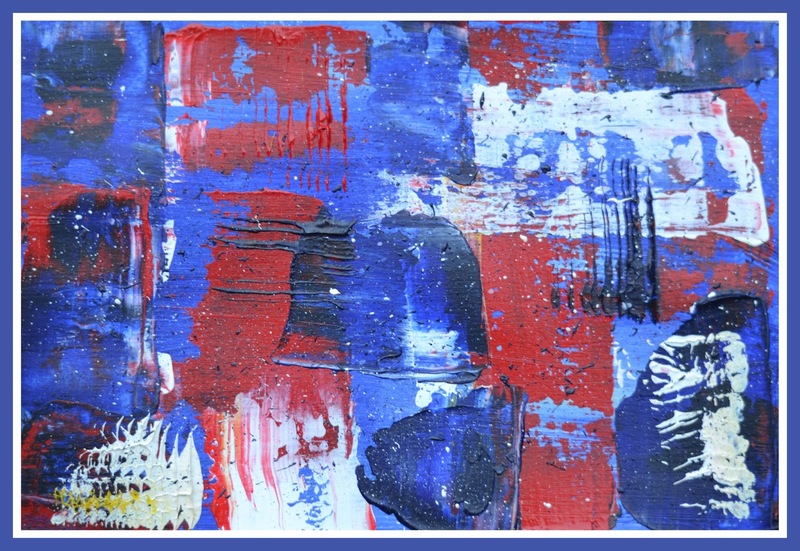 It’s strange because I started taking art classes to train to draw and paint more realistic looking things and what I really like to do is create abstract art. Abstract may be my style, but I’m going to take a drawing class next term to be sure. 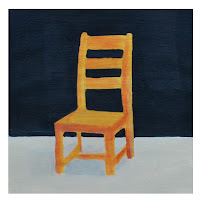 'Painting wood: Chair' was project 38 in “Little Ways to Learn Acrylics: 50 small painting projects...” by Mark Daniel Nelson. This was an interesting exercise and for once I didn’t go crazy trying to make everything perfect. Painting the textured wood surface first worked, except that painting the background as negative space didn't leave room for error:(. 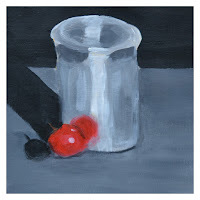 Today I'm posting two still life projects from “Little Ways to Learn Acrylics: 50 small painting projects...” by Mark Daniel Nelson. 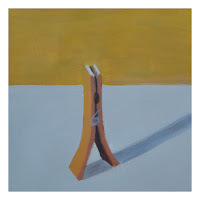 They both involve perspective, straight lines and cast shadows…all the things I’m not good at so don’t expect much. 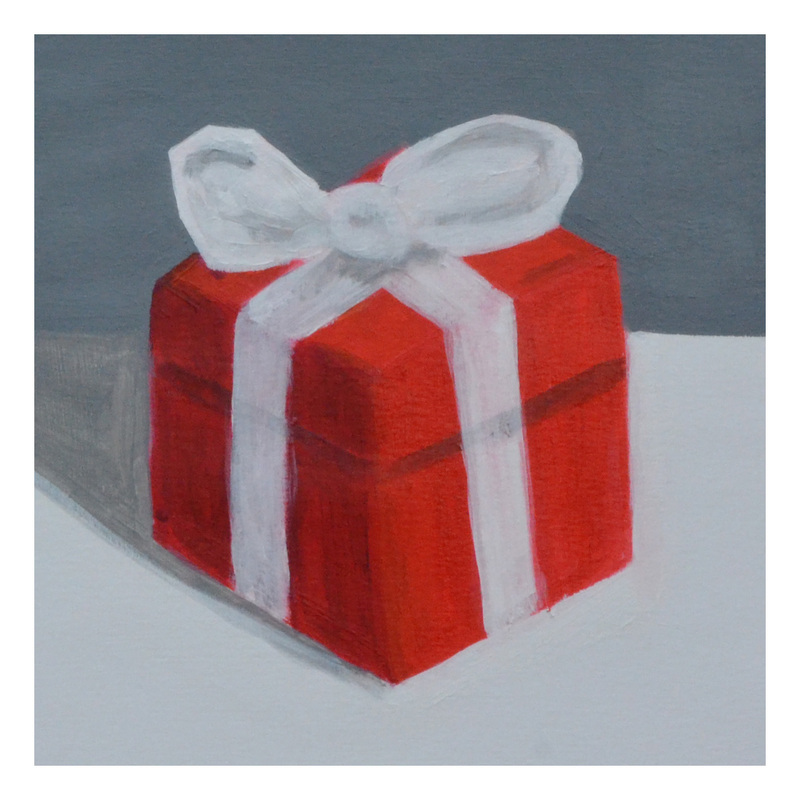 Project number 36 ‘Warm light, cool shadow: Gift box’. This exercise is similar to project 8; didn’t like it then, don’t like it now. Not finding my style yet but I am learning what it isn’t. As with the cardboard box, I spent a lot of time working and reworking the sides but this was more difficult because it had a ribbon. I left it on my easel for days messing around and then finally accepted the fact that it’s never going to be perfect. Project number 37 ‘Rendering intricate details: Clothes peg’ was described in the book as having intricate parts that make it a challenging subject. Well that’s putting it mildly. Even though it was difficult to paint, the 'Clothes peg' was much easier than the ‘Gift box’. It might be because I didn’t get too worked up about the accuracy of shape and perspective. Watercolour classes with Karen Pearson were a good opportunity to learn drawing and composition but my watercolour skills didn’t really advance. 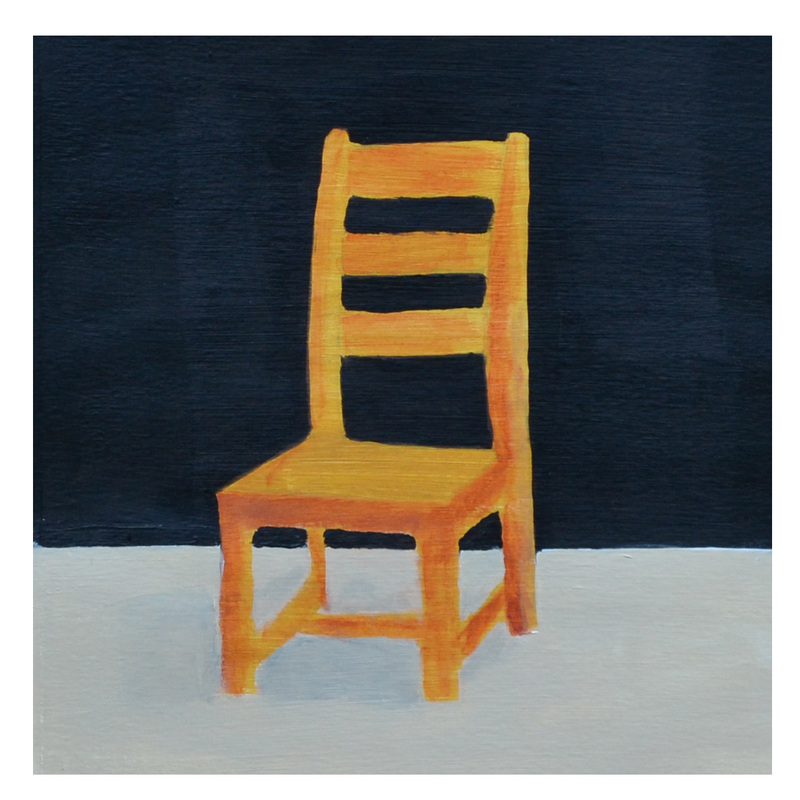 To my surprise, in only one of Karen's acrylic painting classes I felt a big improvement. At home, there were a few minor adjustments but for the most part the painting was finished in 3 hours. As always there are things that probably could be perfected but I want to paint something new in her next class. 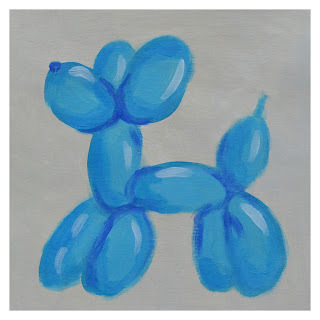 Project 35 in “Little Ways to Learn Acrylics: 50 small painting projects...” by Mark Daniel Nelson is ‘Rendering a transparent object: Balloon dog’. This exercise is now my favourite; from the first step the image was pretty remarkable. My only regret is that I painted it on mixed media canvas and not a canvas board. The book suggests trying this exercise again with different balloon animals and colours… will do it after finishing the book :).